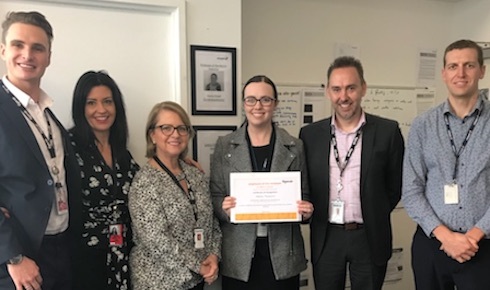 Tigerair has presented Swissport Sydney Domestic Operations Coordinator Abbey Treasure with an ‘Employee of the Moment Award’ in recognition of her leadership and dedication. Tigerair General Manager of Customer Journey Hope Antzoulatos presented the award and flight vouchers, alongside Michael Beveridge, Head of Customer Delivery. Pictured: Callum Merrick (Tigerair Sydney Base Manager), Kathryn Owen, Hope Antzoulatos, Abbey, Michael Beveridge, Dan Greenwood (Swissport Sydney Domestic Ops Manager).